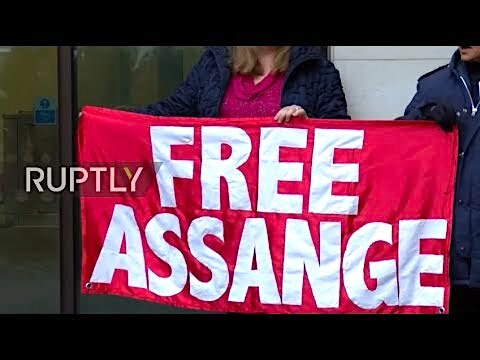 After a seven-year standoff at the Ecuadoran embassy in London, British police on Thursday arrested WikiLeaks founder Julian Assange--a development press freedom advocates had long feared. Has Bernie Sanders made a statement ye,t and if not, why if you know ? Wasn’t there supposed to be a ‘dead man switch’ and a dump of all wikileaks info if Assange was arrested? Have we seen that yet? MORE kudos to Tulsi! WHERE’S BERNIE???!!! Folks, fasten your seat belt and sit back for less than twenty minutes and watch Jimmy Dore team up with a “strange bedfellow” to DESTROY the corporate media whores! It looks like somebody at the Ron Paul Institute. I doubt that’s the same as Ron Paul himself. Please don’t hold your breath, CB4P. One of our friends observed that this issue might draw clearer distinctions (or lack thereof) between the candidates. For my part, I’m definitely leaning Tulsi-ward at this point. She’s the closest approximation to sincere solidarity I can find. Hi Clyde_Crebbafrabitz: LOL, I Love Tulsi—and I think it’s time that someone who has actually been in a war is elected. The ones we have had for such a long time like Clinton, Bush the 2nd, Obama, and Trump have no reference point—except KILL. I can tell you that a lot of his apparent followers say that he “cannot” make a statement. because he “has to” say things that will allow him to be nominated within the Democratic Party. I think this particular litmus test needs the reverse reading. Sanders has to show that he has not caved in to the neoliberal, corporatist, et ceteral and so forth Democratic Party machine that rigged the last nominations. I think he does not make a statement because he has indeed caved in to the party machine, and that this is consistent with his endorsement of Hillary Clinton and his parroting of the “Russiagate” nonsense. And along those lines, I have heard not one word coming from the various self-proclaimed socialists–only Tulsi Gabbard for the Democrats and Ron (not Rand) Paul for the Republicans.